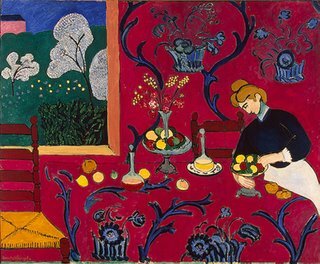 a room perfectly red, with a maid in black and white laying a table already set with a vase of flowers, decanters of red and white wine, assorted fruit. Two rush-plaited chairs up against the table, and a window to the left. Giant blue arabesques that swarm like serpents over tablecloth and wallpaper. The Fall of Icarus, Apollo and Daphne, The Beheading of St John and the Baptist, The Annunciation of the Blessed Virgin Mary, The Count and Countess of Pujois, The Painter Himself, Etc. How exactly the silent flow of black hyphens across my screen as I hold down the key replicates the progress of the cat! 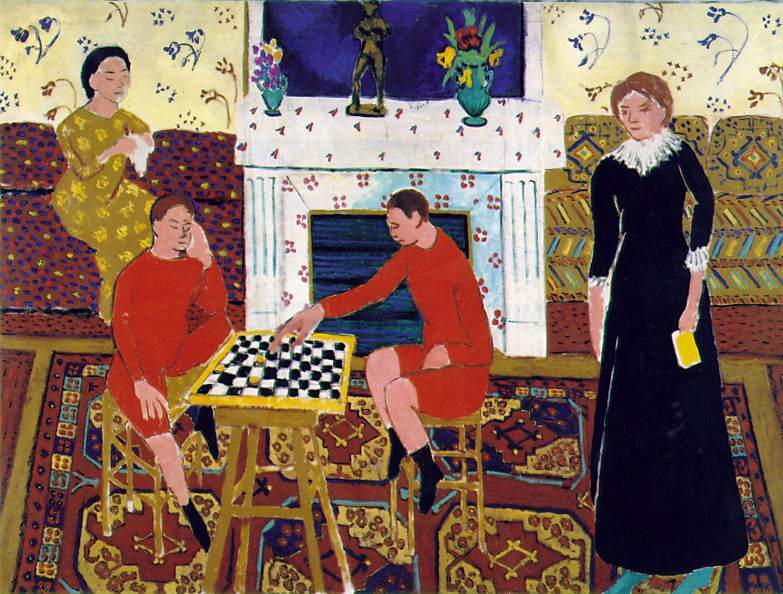 The other Matisse painting that’s central to Red is The Painter’s Family. The boys wear blazing red suits even as they doze over the game. In later life Pierre will recall the tedium of these sittings; the painting shows Matisse knows how they felt. With a few crisp brush strokes this colourist with line catches the moods of his sitters: boredom in the boys, abstraction in his wife, and in his fifteen-year-old daughter, on the edge of womanhood, a molten mix of emotions as she, and only she, gazes out of the painting. This is the first book Sealy’s written on the computer, abandoning longhand for the keyboard, and it shows; he’s had fun with typography and fonts, he includes a few of his own poems (Appendix, Marguerite, Red, Ribbon…), and the writing seems crisper and tauter. Don’t take my word for it, go browse Red yourself.